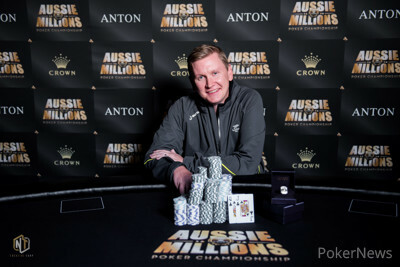 The 2018 Aussie Millions has crowned yet another champion at the Crown Casino in Melbourne, the largest casino complex in the Southern Hemisphere and one of the largest in the world, and it was Ben Lamb that claimed the ANTON Jewellery championship ring and A$647,114 (~$524,764) in Event #9, the $25,000 Challenge. Lamb cut a deal with Jan-Eric Schwippert that saw the duo take home the lion's portion of the A$2,736,000 prize pool before flipping blind for the victory. Two-time World Series of Poker Main Event finalist Lamb, with more than $8.3 million in cashes, and Schwippert, one of many young Germans that made a name for themselves in the High Roller scene in the last few years with $4.2 million in tournament cashes, both dominated throughout the day and it came as no surprise that they'd be the last two standing. It was Lamb that won the flip and sat down for the winner pictures at half past midnight local time. Kitty Kuo, who led the final 19 hopefuls into the second and final day, narrowly fell short in her bid to win the first major title after first-place finishes in smaller events in Macau, Manila and Las Vegas, but the 4th on Taiwan's all-time money list still recorded a career-best payday of A$246,240 (~$199,454) for her 4th place finish. The money bubble was looming when the action got back underway with the top 14 spots being paid and Jordan Westmorland was the first casualty. After losing a big portion of his stack flush-under-flush, his ace-king failed to hold up against the jack-eight suited of Rory Young as the Aussie hit running cards for a straight. Marius Gierse and Danny Tang followed to the rail and two of the remaining three Aussies in the field were ousted without anything to show for. 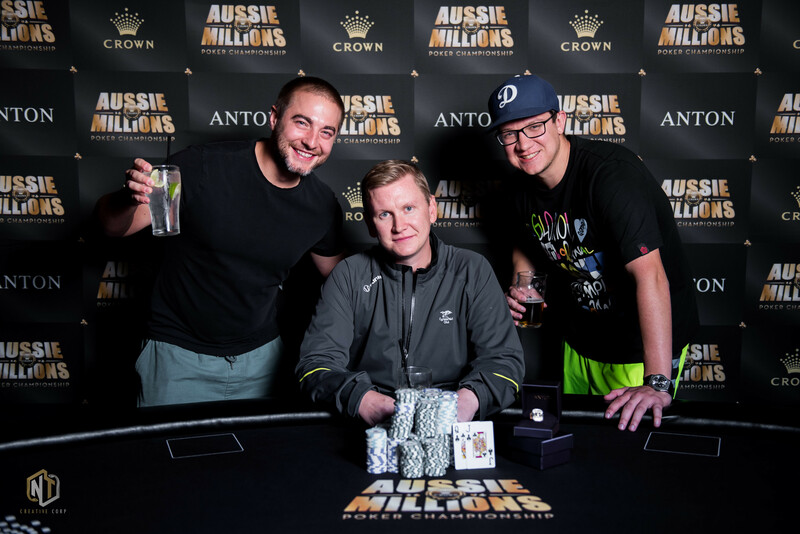 Jonathan Karamalikis fell short of the money by two spots and Michael Addamo's hero-call with queen-jack suited for second pair was no good, as the very aggressive Ben Lamb had flopped top pair with ace-king. Once the bubble had burst, the initial eliminations in the money came at a quick pace and Stefan Huber, Yury Zinkevich and Kazuhiko Yotsushika all ran out of chips a few minutes apart from each other. 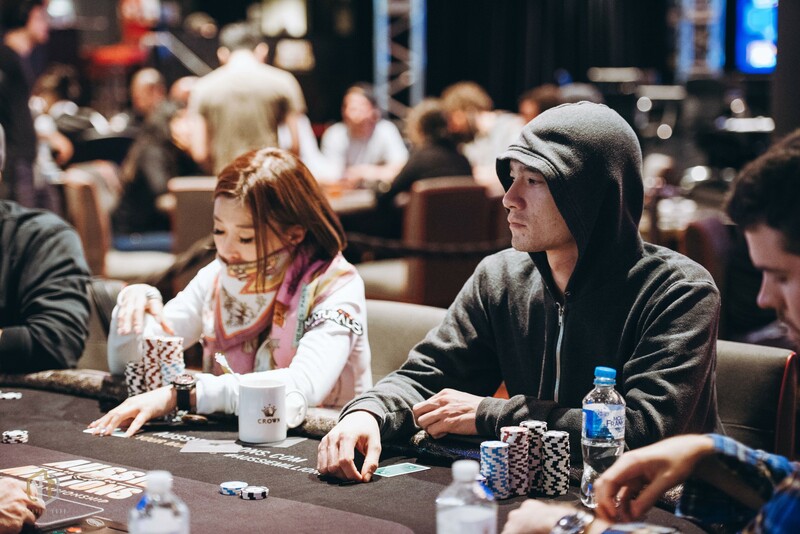 Mustapha Kanit missed out on the final table group shot after his flushdraw with jack-four suited didn't get there to crack the slow-played pocket aces of Wayne Yap. 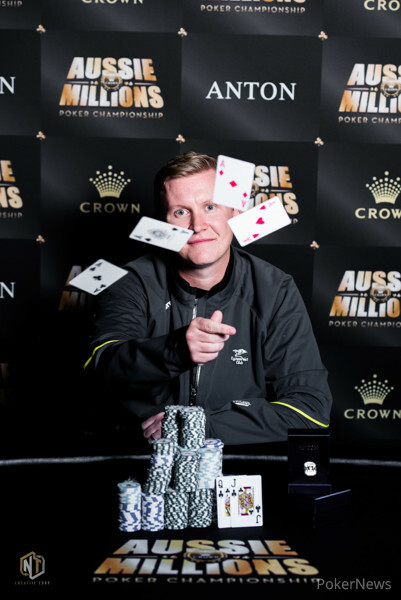 Jack Salter, 3rd in England's all-time money list, won a ring at the Aussie Millions in 2014 in a A$5,000 No Limit Hold'em Six Max Event and recorded another three runner-up finishes in tournaments here at the Crown Casino. This time, Salter had to settle for 5th place when his queen-jack ultimately got rivered by Ben Lamb's ace-ten after the latter improved to a flush. For Kitty Kuo, who led the field as chip leader into Day 2, it was yet another deep run that came to an end in 4th place. Jan-Eric Schwippert shoved with queen-five and Kuo called off her short stack with ace-nine to see a five appear on flop and river, giving Schwippert trips. 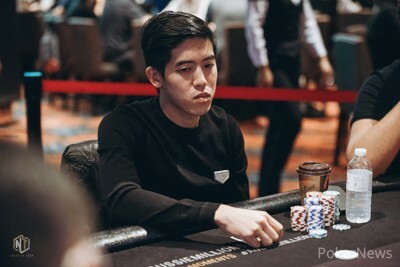 After having doubled his short stack several times on the final table, Wayne Yap eventually picked the wrong time to four-bet shove with king-queen. Ben Lamb almost beat him into the pot with pocket kings and Yap was left drawing dead on the turn of a ten-high board. Lamb and Schwippert checked possible deal numbers right after, shook hands and flipped blind for the ANTON Jewellery championship ring with the better end for Lamb. After the deal negotiations concluded, the pair decided that they were going to flip to decide who won the ANTON Jewellery championship ring. Ben Lamb had moved a stack forward already before the cards were dealt. "You have to say all in," said Lamb to Schwippert before his opponent looked at his cards. "I'm all in," said Schwippert. "I call," said Lamb, and the cards were turned over. Cheered on by a boisterous rail which included 2018 ring-winner Chance Kornuth, Lamb's Queen-high held on a board and he took down the title and the Championship ring. Schwippert takes home A$597,765 (~$484,746), while the winner picture duties await momentarily for Lamb. Deal and Blind Flip for the Ring! In ther first hand back from the break, Wayne Yap raised to 63,000 on the button and Ben Lamb in the small blind three-bet to 176,000. Back on Yap, he moved all in and Lamb almost beat him into the pot with the call. The board of left Yap drawing dead on the turn and he was eliminated in 3rd place for A$328,320 (~$265,939). Lamb and Jan-Eric Schwippert asked for the clock to be stopped right after to check the counts and a possible deal. Jan-Eric Schwippert open-shoved out of the small blind and Wayne Yap called from the big blind. The board of stayed clear for Yap and his rail cheered while their favourite doubled for 273,000. Yap remains the far shortest stack, though, and will need another double up or two to have a shot at the title. Wayne Yap limped from the small blind and called a raise by Ben Lamb in the big blind to see a flop of . Yap checked and Lamb bet 80,000, which Yap called. On the turn, Yap checked and called another bet worth 155,000 before checking the third street in a row when the river completed a possible flush draw. Lamb didn't slow down just yet and bet 220,000. Yap eventually called for a decent portion of his remaining stack and mucked when Lamb turned over for two pair, aces and treys. 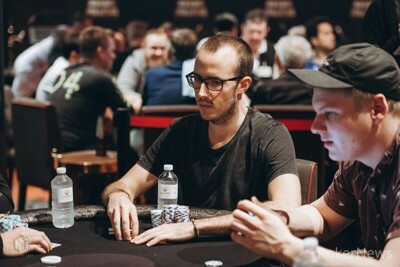 Three-handed play started without any bigger pots and Wayne Yap remains the short stack while Ben Lamb and Jan-Eric Schwippert are almost even at the top of the counts. Yap raised to 53,000 on the button and Schwippert defended the big blind. On the flop, Schwippert checked and folded to a bet of 40,000. Yap and Lamb then chopped a hand with versus before Schwippert opened to 60,000 on the button the next hand. Only Lamb in the big blind called and checked the flop, Schwippert's bet of 50,000 was called and the turn brought checks from both. Lamb bet the river for 121,000 and that was good enough to win the pot without showdown after the fold of Schwippert.